School cafeterias districtwide recently launched some exciting changes, adding new items to their menus and committing to more environmentally friendly practices. New menu items include chicken and chile tamales cooked in traditional corn husks, strawberry and yogurt parfaits with house-made granola, Salvadoran style bean and cheese pupusas, croissant breakfast sandwiches, enchilada burritos with house-made sauce, freshly cut watermelon, fresh jicama with tajin (seasoning) and more. Entrée salads also received makeovers with the introduction of a BBQ chicken salad with house-made BBQ-ranch dressing, Greek salad with house-made vinaigrette, and whole grain garlic-infused croutons. New products were sourced for current favorites such as hamburger patties, hot dogs and chicken tenders. As always, menus include a healthful variety of fresh fruit, fresh vegetables, house-made entrees and whole grains. In addition to the menu makeover, Long Beach Unified School District Nutrition Services proudly announced that school cafeterias will be 100 percent polystyrene (Styrofoam) free by January 2017. Be on the lookout for new eco-friendly containers. Learn more about school menus and meal programs. 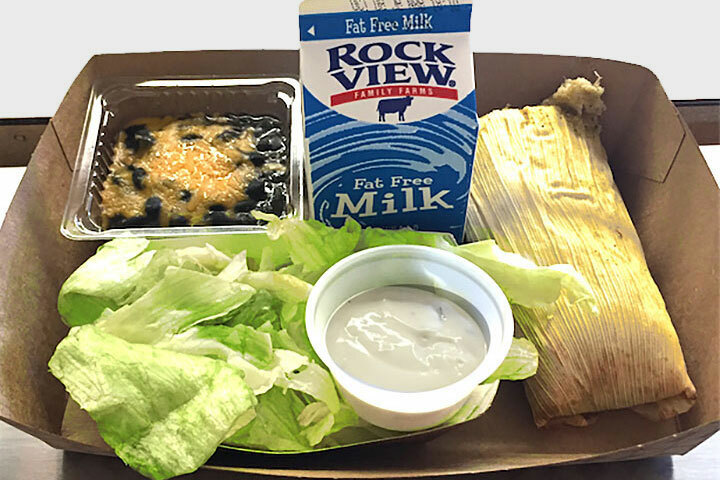 LUNCH TIME – Chicken and chile tamales cooked in traditional corn husks are among the new items on school meal menus.